The Theory of Everything is part biographical part love story based on the memoir Traveling to Infinity: My Life With Stephen by Jane Wilde Hawking dealing with her relationship with her ex-husband, theoretical physicist Stephen Hawking, his diagnosis of motor neuron disease and his success in physics. 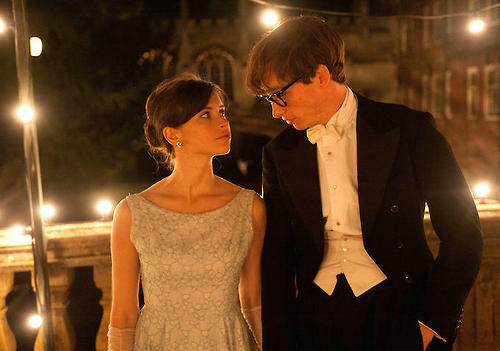 The Theory of Everything has received praise for its acting (particularly for Redmayne and Jones), James Marsh’s direction, Anthony McCarten’s screenplay, Benoît Delhomme’s cinematography, Jóhann Jóhannsson’s musical score and its overall production. Catherine Shoard of The Guardian praised the film and particularly Redmayne, writing, “Redmayne towers: this is an astonishing, genuinely visceral performance which bears comparison with Daniel Day-Lewis in My Left Foot. The film balances both beauty and fact with an elegance seldom seen in theaters. If I were to have it my way, both leads would be taking home golden statues for their challenging portrayals executed so effortlessly on screen. What appears to be one of the most challenging stories to execute has produced some of the most picturesque scenes in film this year. Here are a few scenes that I consider to be some of the film’s most beautiful shots. Great post! Love the way you have really looked into how visually stunning this film was to go along with the story. Beautiful post! I loved this film. I feel like it’s getting a lot of crap, and it doesn’t deserve that. I’ve heard raves and clear bashing for this film, and I think it just boils down to how much, or what kind, of Oscar bait you enjoy. I really want to see this. It looks vibrant, rich and alive, and while it may, at the end of the day, be a standard Oscar bait biopic, it looks beautifully done, so I’m there! Great review and beautiful shots. I couldnt agree with you more, Andrew. Oscar bait? Yes. But deservingly so! I liked this movie a very great deal too, and have my fingers crossed for Redmayne to get at least an Oscar nom. Many thanks for this visual reminder of how well the movie was put together. Great visual review. Some amazing shots. I really think this film will be heard from again at the Oscars. I hope so! Thanks, Keith! The Imitation Game is next on my “to see” list. I haven’t seen this but I definitely will rent it as soon as it’s available. Sounds like a career-making turn for Eddie Redmayne, which I’ve only seen in smaller parts. The cinematography looks gorgeous too. Thanks, Ruth! Your blog is so great! Be sure to catch this one…its beautiful. I definitely will! I have seen Felicity Jones in a few things and love her work too, so there’s another reason to check this one out. I love that fireworks gif you have at the top of the review!